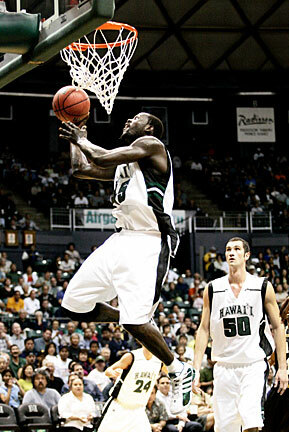 Ahmet Gueye of Hawaii soared for two of his 11 points last night against Idaho. As Hawaii and Idaho headed toward their benches just before the tip-off of last night's Western Athletic Conference game, Julian Sensley picked up a stray basketball near midcourt, spun and lofted a high-arcing shot toward the basket. It was going to be that kind of night. The Rainbow Warriors continued to fill up the net once the game started and cruised to an 81-61 win over the Vandals. A crowd of 4,213 was on hand for UH's best shooting night of the season. The Rainbows (11-8, 5-4) were above the 70 percent mark for much of the game and finished at 63 percent (31-for-49) to rebound from a rough road trip. "This was a good bounce back for us coming off those two road losses," Sensley said. Sensley's warm-up shot set the tone for a game-high 22 points on 10-of-14 shooting. He also grabbed a game-high seven rebounds and dished out five assists. Hawaii guard Matt Lojeski made his first six shots and hit five 3-pointers on his way to a season-high 21 points. "We were due for a game like this," Lojeski said. "A game where we come out and get the lead up to about 10 and work on the things we need to work on instead of having the game come down to the wire." Freshman Dominic Waters sparked the Rainbows off the bench with a season-high 11 points, and forward Ahmet Gueye added 11 points as well. "We did a real good job of moving the ball, everybody got touches, everybody was able to get good looks at the basket," Sensley said. After returning to Honolulu on Tuesday afternoon following Monday's late-night loss at Utah State, the Rainbows had just one day of practice to prepare for Idaho. After a sluggish start, UH coach Riley Wallace credited Waters and fellow freshman Hi ram Thompson for igniting the 'Bows late in the first half. "I was worried about the start of the ballgame because of the fatigue factor," Wallace said. "Yesterday's practice was a little lethargic, and we started that way. "I brought in the two freshmen guards and I thought that kind of turned it around on the zone. They moved the ball a lot quicker and they found open shots that way." Idaho (3-16, 0-8), which has lost its last two games by 55 points, is still in search of its first win as a WAC member. Vandals guard Tanoris Shepard scored a team-high 17 points and Keoni Watson added 14. 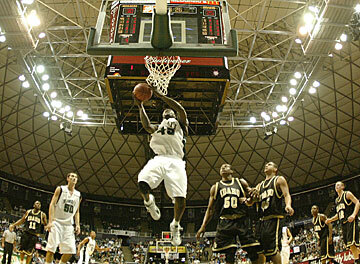 Hawaii's Ahmet Gueye grabbed one of his three rebounds last night in an 81-61 win over Idaho. "The first half, our game plan was great," Idaho coach Leonard Perry said. "I thought it was a game if we played a certain way. But obviously, we're going to have to score the basketball." Idaho led early and stayed close for the first 14 minutes, tying the game at 23 on Shepard's 3-pointer at the 5:55 mark. Waters broke the tie with a 3-pointer from the left wing and UH -- which went 16-for-21 from the field before the break -- went on to outscore the Vandals 19-6 over the remainder of the half to open up a 42-29 lead. "It was a little sloppy, we weren't really moving the ball," Lojeski said. "And then all of a sudden, we were hitting shot after shot." UH opened the second half with a 13-2 run that started with a Lojeski 3-pointer and ended with two spectacular dunks by Sensley. The senior spun along the baseline and attacked the rim for the first slam. He then took a pass from Chris Botez and soared to the basket on the second dunk as UH led 55-31. "Julian played a good inside-outside game," Wallace said. "In the second half when they went (man to man), we ran everything to Julian on those slips (to the basket). That's why he got those dunks. "We have to establish the cuts to the basket, because they're overplaying the shooters." Hawaii closes out its homestand against San Jose State (5-15, 1-6) tomorrow at the Sheriff Center. Tip-off is 7 p.m.
Finis Harwell and Joseph Isom each scored 15 points as Hawaii Pacific upset Brigham Young-Hawaii 69-61 last night at Mid-Pacific Gymnasium. Isom also pulled down seven rebounds for the Sea Warriors (5-14, 1-4 PacWest). Austin Smylie scored 20 points for the Seasiders (10-8, 3-3). BYUH dropped two games behind first-place Chaminade. The Seasiders and Silverswords play a home-and-home Wednesday and next Friday. BYUH led 34-29 at the half before the Sea Warriors came back to get their first win in nine tries against a West region team. Key -- fg: field goals made; fga: field goals attempted; ft: free throws made; fta: free throws attempted; min: minutes played; reb: rebounds; a: assists; tp: total points. Halftime -- Hawaii 42, Idaho 29. 3-point goals -- Idaho 3-15 (Shepard 1-3, Forge 1-3, Ledbetter 1-4, Watson 0-1, Dubois 0-1, Vrzina 0-1, Smith 0-2), Hawaii 10-16 (Lojeski 5-6, Waters 3-5, Wilder 1-1, Sensley 1-3, Tatum 0-1). Personal fouls -- Idaho 17, Hawaii 20. Fouled out--Shepard. Steals -- Idaho 8 (Dubois 4, Shepard 2, Jakovljevic, Kale), Hawaii 5 (Sensley 3, Gueye, Botez). Blocked shots -- Idaho 2 (Watson, Kale), Hawaii 6 (Botez 2, Sensley 2, Lojeski, Gueye). Turnovers -- Idaho 7 (Watson, Shepard, Ledbetter, Dubois, Nwoke, Vrzina, Kale), Hawaii 9 (Lojeski 3, Sensley 2, Gipson, Tatum, Waters, Miller). Officials -- Staffen, Allen, Giarratano. A -- 4,213.